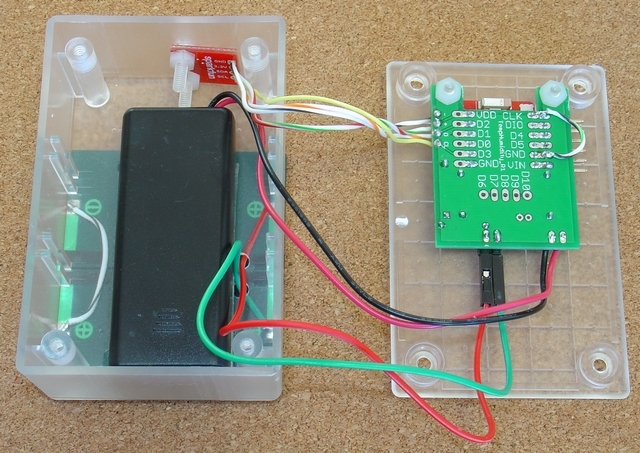 This tutorial, A Very Low Power Temperature Humidity Monitor, is Part 2 of 3. 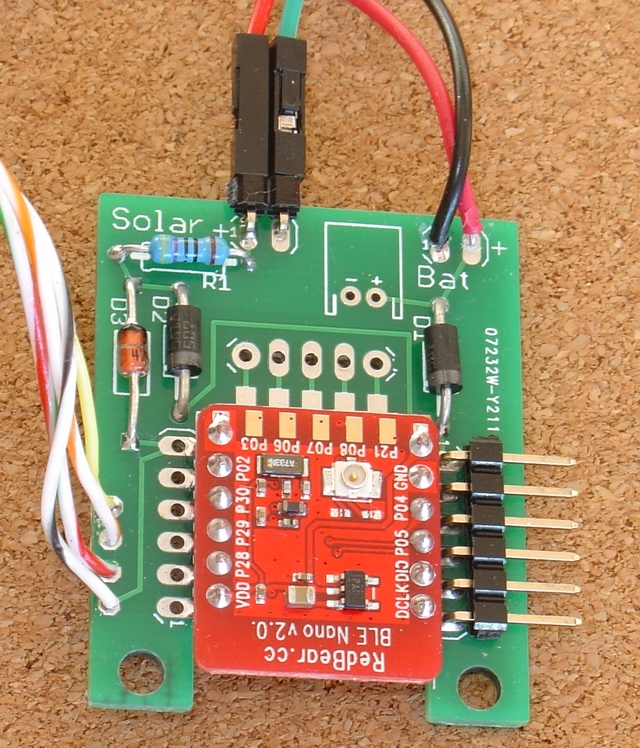 Part 2 – A Very Low Power Temperature Humidity Monitor, this one, covers using a Redbear Nano V2 module and an Si7021 temperature/humidity sensor to build a low power battery / solar monitor. It also covers modifying the Si7021 library to be low power, tuning the BLE device to reduce its current consumption of <25uA and designing a custom temperature/humidity display for your mobile. Part 3 – A Redbear Nano V2 Replacement covers using other nRF52 based modules instead of the Nano V2. It covers selecting supply components, construction, removing the nRF52 chip programming protection, using NFC pins as normal GPIO, and defining a new nRF52 board in Arduino. This tutorial is a practical application of Part 1 Building Very Low Power BLE devices made Easy with Arduino by constructing a Very Low Power BLE Temperature and Humidity Monitor. The monitor will run for years on Coin Cell or 2 x AAA batteries, even longer with solar assist. This tutorial covers tuning the BLE parameters for low power consumption and how to power you device from battery OR battery + solar OR solar only. 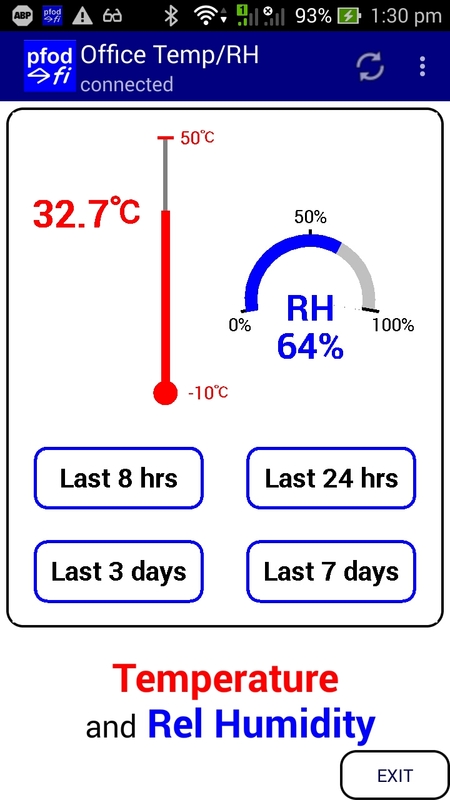 As well as displaying the current temperature and humidity, the monitor stores the last 36 Hrs of 10min readings and the last 10 days of hourly readings. These can be charted on the your Android mobile and the values saved to a log file. No Android Programming is required, pfodApp handles all of that. The Android display and charting is completely controlled by your Arduino sketch so you can customize it as required. A Redbear Nano V2 board is used for the nRF52832 BLE component and a Sparkfun Si7021 breakout board is used for the Temperature / Humidity Sensor. A modified low power library is used with the Si7021. A small PCB was designed to hold the NanoV2 and supply components. However since there are no surface mounted components used, you can just as easily build this on vero board. Three power supply versions are covered. i) Battery plus Solar assist, ii) Battery Only, iii) Solar Only. 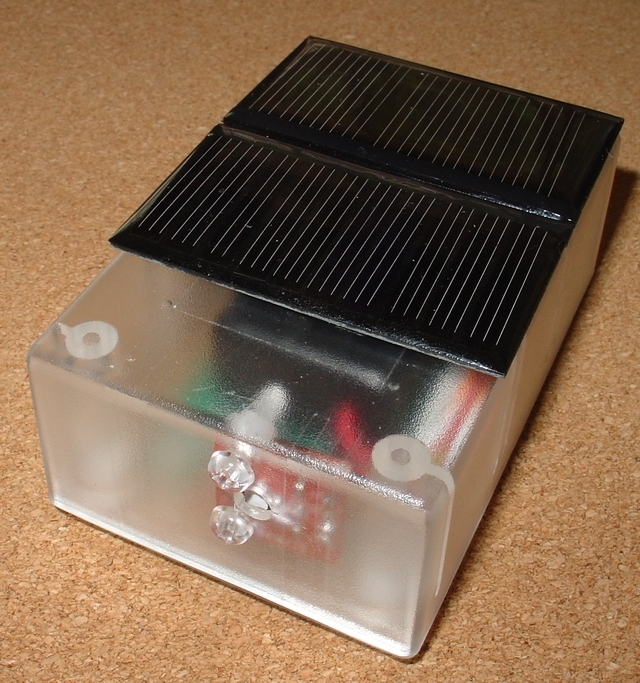 The Solar Only option does not have any battery storage and so will only run when there is some light. A bright room light or desk lamp is sufficient. As mentioned in Part 1 – The trick to getting a really low power solution is to do nothing most of the time, minimize the current through external pull-up/pull-down resistors on inputs and don't have any extra components. 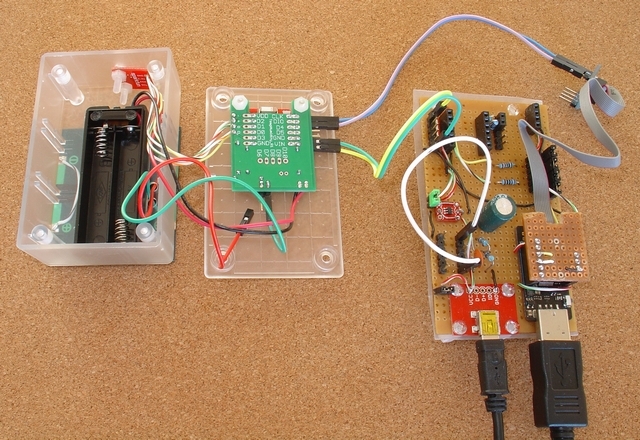 This project will use each of those tricks to get a low power solution. The nRF52832 chip can run with a power supply of between 1.7V and 3.6V (absolute max voltage 3.9V). This means you could power the chip directly from a coin cell or 2 x AAA batteries. However it is prudent to add a voltage regulator to protect the chip from over volts. This extra component comes with a power cost, but in the case of the NanoV2 board the on-board regulator, TLV704, consumes less than 5.5uA max, typically only 3.4uA. For this small extra power usage you get protection for up to 24V supply inputs. The Si7021 sensor itself draws typically <1uA when not taking a measurement, i.e. in Standby, and up to 4mA when transmitting the data via I2C. Since we don't take measurement continually, the 4mA is not a significant part of the average supply current. Taking a reading very 30 seconds adds less then 1uA to the average supply current, see the supply current measurements below. 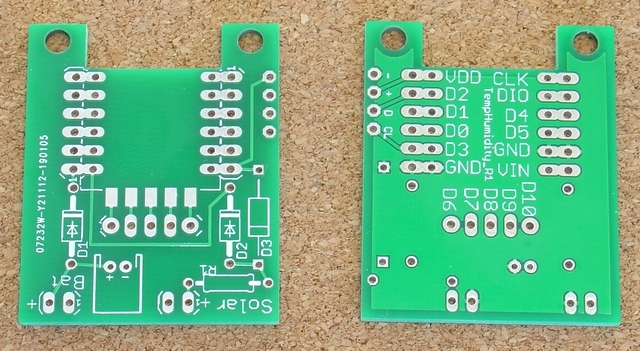 There are two readily available Si7021 breakout boards. One from Adafruit and one from Sparkfun. A quick glance at the two boards will tell you that the Adafruit board has many more components than the Sparkfun board, so you would be inclined chose the Sparkfun board. Looking at the schematics for each board shows that the Sparkfun board is just the bare sensor and two 4k7 pullup resisotors, while the Adafruit board has an on-board, MIC5225, regulator which typically draws 29uA all the time. This is significant when the over all current for rest of circuit is <30uA. Since we already have a regulator for the nRF52832 chip, this extra component is not needed and the Si7021 can be powered from that 3.3V supply. So this project will use the Si7021 breakout board from Sparkfun. The 4K7 I2C pullup resistors are not particularly high value and will draw 0.7mA when pulled low. This would be a problem if they where on a switch input that was grounded for long periods. However in this project the current through these resistors is minimized by only using the I2C interface infrequently and for only a short time. Most of the time the I2C lines are not in use and are high / tri-state so no current flows through these resistors. The project is constructed on a small PCB, but since there are no SMD components, it can be just as easily be built using vero board. The PCB was manufactured by pcbcart.com from these Gerber files, TempHumiditySensor_R1.zip The PCB is general purpose enough to be used for other BLE projects. The construction is straight forward. The battery holder and the solar cells are secured to the plastic box with heavy duty double sided tape. Note the Gnd link wire from the CLK to GND in the finished part. This is installed AFTER programming to prevent noise on the CLK input from triggering the nRF52 chip into a high current debug mode. Download the zipped code, lp_BLE_TempHumidity_R2.zip, and unzip it to your Arduino Sketches directory. You also need to install the lp_So7021 library from this zip file and also install the pfodParser library. Both Adafruit and Sparkfun provide support libraries to access the Si7021 sensor, however both those libraries are unsuitable for very low power use. The both use a delay(25) in the code to delay reading the sensor while it is taking its measurement. As noted in Part 1 Delays are Evil. The Arduino delay() just keeps the micro-processor running using power while it waits for the delay to time out. This breaks the first rule of low power BLE, do nothing most of the time. The replacement lp_Si7021 library, replaces all delays with lp_timers which put the micro-processor to sleep while waiting for the sensor to finish its measurement. How much difference does the lp_Si7021 library make? Using the original SparkFun Si7021 support library and taking one reading a second without any Serial prints, draws ~1.2mA average. Replacing the Sparkfun library with the lp_Si7021 library reduces the average current to ~10uA, i.e. 100 times less. In this project the fastest measurement rate is once every 30 seconds when the mobile is connected, which results in an average sensor current of less than 1uA. When there is no BLE connection the measurement rate is once every 10 mins and the average sensor supply current is negligible. Above is the main screen display and two of plot options. Plots can also be zoomed and panned in both directions, using two fingers. The user interface is coded in the Arduino sketch and then sent to pfodApp on the first connection where is it cached for repeated use and updates. The graphical display is built from drawing primitives. See Custom Arduino Controls for Android for a tutorial on how to build your own controls. The Thermometer, RHGauge and Button files contain the drawing commands for those items. Note: None if this display is built into pfodApp. The entire display is completely controlled by the code in your Arduino sketch. The sendDrawing_z() method in the lp_BLE_TempHumidity.ino sketch defines the user interface. The pushZero commands change the origin and scaling for drawing the next component. This lets you easily change the size and position of the buttons and gauges. On the first connection the initial display takes 5 or 6 sec to down load the ~800 bytes that define the display. 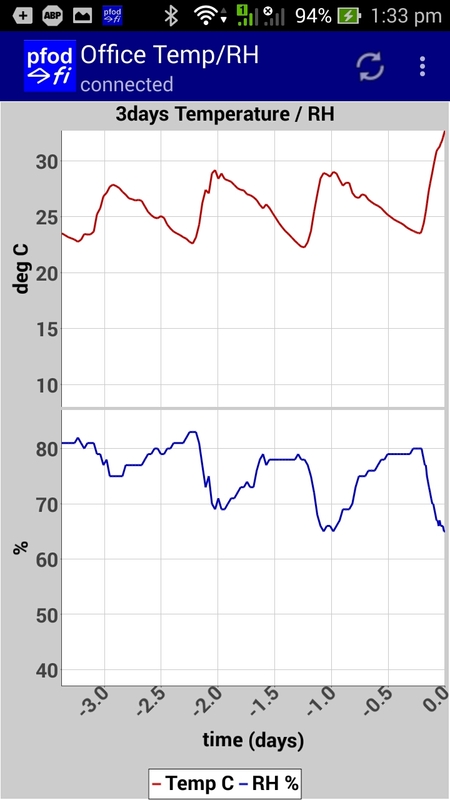 pfodApp caches the display so future updates only need to send the changes, gauge positions and readings. These updates only take a couple of seconds to send the 128 bytes need to update the display. When you click on screen above the buttons, the 'u' dwg command is sent to your sketch to force a new measurement and screen update. Normally when connected, updates only happen every 30sec. Each click or refresh of the drawing forces a new measurement. The response from the Arduino sketch to pfodApp is delayed until the new measurement is completed (~25mS) so that the latest value can be sent in the update. The Arduino Sketch, lp_BLE_TempHumidity_R2.ino, is an enhanced version of the example sketch used in Part 1. The lp_BLE_TempHumidity_R2.ino sketch replaces the menu with the drawing shown above. It also adds the lp_Si7021 sensor support and data arrays to store the historical measurements. The main complication in the lp_BLE_TempHumidity.ino sketch is to handle sending the plot data. As the measurements are made readRHResults() handles collecting the results and saving them to the historical arrays. The arrays are 120 long but when the data is sent the first 30 data points are for at a finer time interval. Each data point is ~16 bytes long, in CSV text format. So 150 points is 2400 bytes of data. The lp_BLESerial class has a 1024 byte buffer, which is large enough for the largest pfod message. Once that buffer is full any further bytes sent are discarded. So to avoid filling the buffer and loosing plot data, the plot points are sent one each 200mS. With a maximum connection interval of 150mS this ensures the send buffer is not filled and none of the plot data lost. To avoid the plot data slowing down the main display updates, the plot data is only sent while the plot screen is displayed. Once the user switches back to the main screen, sending the plot data is paused. Sending the plot data is resumed when the user clicks the plot button to display the plot again. The historical plots start from 0 (now) and go backward in time. If there has been no new measurement since the last plot was displayed, the previous data that was already downloaded is just displayed again immediately. If there is a new measurement. Then previous plot data is cleared and then the new data downloaded. When the monitor is first powered up, there are no historical readings and 0 is stored in the arrays as an invalid reading. When the plot is displayed, invalid readings are just skipped, resulting in a shorter plot. If there are not valid historical readings, the current measurement is just sent twice to create a short line on the plot. 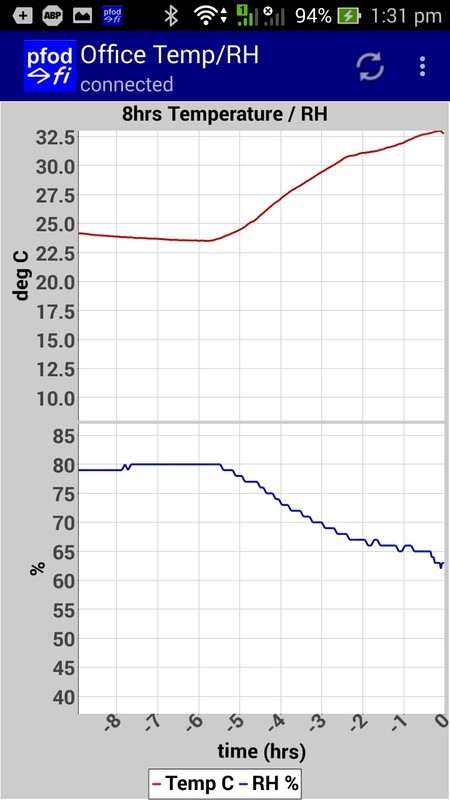 Using the lp_Si7021 library, even taking a temperature/humidity measurement every 10 secs only contributes ~1uA to the average supply current, so the main factor in the supply current and hence battery life is the current used by the BLE advertising and connection and data transmission. You can now program NanoV2 and measure the supply current as described in Part 1. As mentioned above the contribution of the sensor is <1uA, average, at the highest measurement rate used in this project, so the BLE advertising and connection parameters are the determining factor for battery life. The BLE advertising and connection parameters that effect current consumption are :-Tx Power, Advertising Interval, Max and Min Connection Intervals, and Slave Latency. Note: Using the connections above there are two (2) regulators in the supply, one on the NanoV2 board via Vin and the MAX8881 on the programmer's supply. This means the measured supply currents will be ~5uA higher than actual, due to the second regulator. The values quoted below are the measured currents minus this extra 5uA. Tx Power effects supply current both when connected and when advertising (not-connected). This project uses the maximum power setting (+4) and provides the best range and greatest noise immunity for the most reliable connections. You can use the lp_BLESerial setTxPower( ) method to change the power setting. Valid values are, in increasing power, -40, -30, -20, -16, -12, -8, -4, 0 +4. You must call the lp_BLESerial begin() method BEFORE you call setTxPower(). See the lp_BLE_TempHumidity.ino sketch. You can experiment with reducing the Tx Power, but the compromise is short range and more connection drop outs due to interference. In this project the Tx Power is left at its default, +4. As you will see below, even with this setting, very low supply current are still possible. For a given Tx Power, when there is no connection, the Advertising Interval sets the average current consumption. The recommended range is 500 to 1000mS. Here 2000mS was used. The compromise is that longer advertising intervals means it is slower for your mobile to find the device and set up a connection. Internally, advertising intervals are set in multiples of 0.625mS in the range 20mS to 10.24sec. The lp_BLESerial setAdvertisingInterval( ) method takes mS as the argument, for convenience. Once a connection is established, the connection interval determines how often the mobile contacts the device. The lp_BLESerial setConnectionInterval() lets you set the suggested max and min, however the mobile controls what the connection interval actually is. For convenience the arguments to setConnectionInterval() are in mS, but internally the connection intervals are in multiple of 1.25mS, in the range 7.5mS to 4sec. The default setting is setConnectionInterval(100,150) i.e. min 100mS to max 150mS. Increasing these values reduces the supply current while connected, but the compromise is slower transmission of data. Each update of the screen takes about 7 BLE messages, while a full 36hrs of 10min measurements takes about 170 BLE messages. So increasing the connection intervals slows down the screen updates and the plot displays. The lp_BLESerial class has a 1024 byte send buffer and only sends one block of 20 bytes from this buffer, each max connection interval to prevent flooding the BLE link with data. Also when sending plot data, the sketch only sends one data point each 200mS, to avoid flooding send buffer. This throttling of the sends makes the data transmission to the mobile reliable, but it is not optimized for maximum through put. In this project the connection intervals were left as the default values. When there is no data to send to the mobile, the device can optionally ignore some of the connection messages from the mobile. This saves Tx Power and supply current. The Slave Latency setting is the number of connection messages to ignore. The default is 0. The lp_BLESerial setSlaveLatency() method can be used to change this setting. The default Slave Latency of 0 gave ~50uA supply current, ignoring the screen updates every 30 secs, but including the keepAlive messages very 5 secs. Setting the Slave Latency to 2 gave an average connected supply current of ~25uA. A Slave Latency setting of 4 gave ~20uA. Higher settings did not seem to reduce the supply current so a Slave Latency setting of 4 was used. Using the settings above, as set in lp_BLE_TempHumidity.ino, the Total Supply current when Connected and updating the display every 30 secs, approximately 25uA. When not connected it is approximately 18uA. For calculating battery life, it will be assume the mobile is continually connected and displaying the current temperature and humidity, i.e. continual current draw of ~25uA. If the a connection is only made once or twice a day to look at the history then the battery life will be increased by about 1/3. Various batteries have difference capacities and voltage characteristics. The batteries considered here are CR2032 coin cell, CR2450 (N) coin cell, 2 x AAA Alkaline, 2 x AAA Lithium and LiPo. Note: The 22uF LowESR capacitor ( C1 ), in addition to the on board NanoV2 22uF capacitor, stores the Solar Cell current and then supplies it for the TX current pulses. Other wise the battery supplies some of the TX current. This extra 22uF LowESR adds about 10% to the battery current when the solar cell is not the supply, but also extends the battery life by compensating for the rising battery internal resistance as the battery reaches end of life. The measurements below were taken WITHOUT the additional 22uF capacitor. LiPo rechargable – not recommended due to high self-discharge. This coin cell has capacity of typically 235mAHr (Energizer Battery), a nominal voltage of 3V and a specified discharge voltage of 2V. This implies a battery life of 9400hrs or ~1yr 3m. However the internal cell resistance increases as the battery reaches end of life and so may not be able to provide the peak Tx current pulses. A larger supply capacitor can be used to reduce this effect, but say 1yr life. This coin cell has capacity of typically 620mAHr (540mAHr for CR2450N), a nominal voltage of 3V and a specified discharge voltage of 2V. This implies a battery life of 24,800hrs or ~2yr 10m (21600hrs ~2yrs 6m for CR2450N). However the internal cell resistance increases as the battery reaches end of life and so may not be able to provide the peak Tx current pulses. A larger supply capacitor can be used to reduce this effect, but say 2yr 4m (2yr N) life. Note: The CR2450N version has a thicker lip which helps prevent incorrect installation in a CR2450N holder. You can insert a CR2450N and CR2450 cell in a CR2450 holder but you cannot insert a CR2450 cell in a CR2450N holder. These batteries have a capacity of about 1250mAHr (Energizer Battery) for very low currents, a nominal voltage of 2x1.5V = 3V and a specified discharge voltage of 2x0.8V = 1.6V. But this specified discharge voltage is less than the operating voltage of the Si7021 sensor (1.9V) so the battery can only be used down to ~1V each. This reduces the capacity by about 10% to 15% i.e. ~1000mAHr. This implies a battery life of 40,000hrs or ~4yr 6m. However the internal cell resistance increases as the battery reaches end of life and so may not be able to provide the peak Tx current pulses. A larger supply capacitor can be used to reduce this effect, but say 4yr life. Note Alkaline batteries have a self discharge of 2% to 3% per year. These batteries have a capacity of about 1200mAHr (Energizer Battery), a nominal voltage of 2x1.7V = 3.4V, at low currents, and a discharged voltage of 2x1.4V = 2.4V. This implies a battery life of 48,000hrs or 5yr 5m. These batteries come in various capacities from 100mAHr to 2000mAHr, in flat formats, and have a charged voltage of 4.2V and a discharged voltage of >2.7V. However they have a high self-discharge of 2%-3%/month (i.e. 24% to 36% per year) and so are not as suitable for this application as the other batteries. The construction above uses the Battery plus Solar Assist supply. When the solar panels generate more voltage than the battery voltage, the solar cells will power the monitor, so extending the battery life. Typically the battery life can be extended by another 50%. 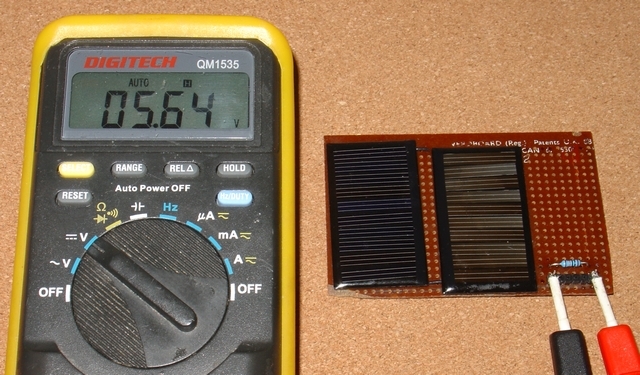 The solar panels used are small, 50mm x 30mm, cheap, ~$0.50, and low power. They are nominally 5V panels, but need full direct bright sunlight to generate 5V. In this project two panels are connected in series so that placing the monitor some where near a window, out of direct sun, is sufficient to power replace the battery power. Even well lit room, or a desk lamp, is enough for the solar cells to generate >3.3V at >33uA and take over from the battery. A simple test panel was constructed to determine where the Temperature / Humidity Monitor could be placed, out of the sun and still be solar powered. As you can see from the photo below, the two panels connected to a 100K resistor are producing 5.64V across the 100K, i.e. 56uA current at 5.64V. This is more than sufficient take over powering the monitor from the battery. Any voltage reading above the nominal battery voltage of 3V means the solar cells will be powering the monitor instead of the battery. 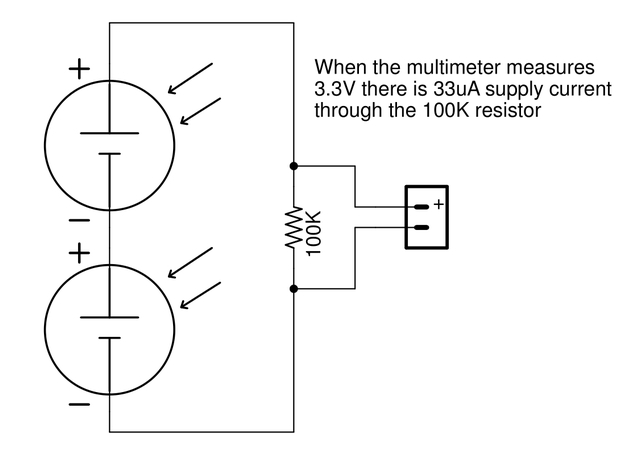 The two diodes in the Temperature Humidity Monitor circuit isolate the solar cells and the batteries from each other and guard against connecting them in reverse polarity. The 10V 1W zener and 470R series resistor protects the NanoV2's on-board regulator from over voltage from two solar cells in full sun, particularly if 12V cells happen to be used instead of 5V ones. In normal operation at <5V, the 10V zener only draws ~1uA. For a Battery Only Supply, just omit R1, D1 and D3 and the solar cells. You can also replace D1 with a piece of wire if you don't want reverse polarity protection. 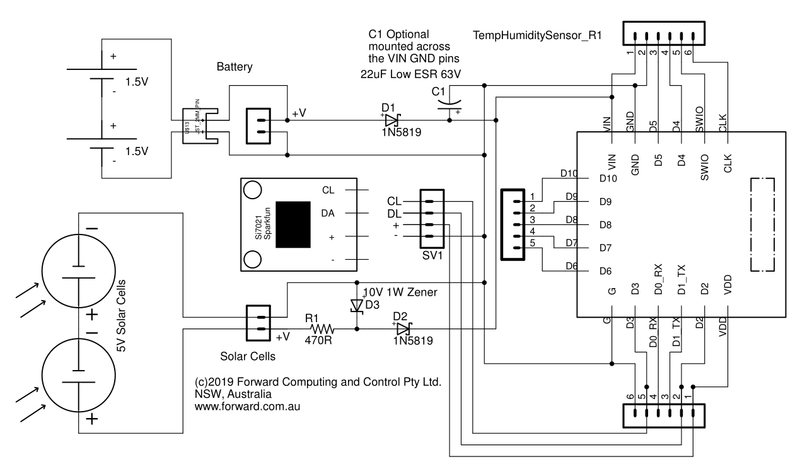 Powering the monitor from Solar Cells only, with no battery, requires a different power supply circuit. The problem is that while the monitor will operate on 25uA, on power up the nRF52 draws ~5mA for 0.32 sec. The circuit shown here (pdf version) holds the MAX8881 regulator off until the input capacitors, 2 x 1000uF, charge up to 4.04V. Then the MAX6457 releases the MAX8881 SHDN input to power up the nRF52 (NanoV2) The 2 x 1000uF capacitors supply the necessary start up current. This lets the monitor power up as soon as there is enough solar power keep it running at 25uA. This tutorial has presented a battery/solar powered Temperature Humidity Monitor as an example very low power BLE project in Arduino for the nRF52832 chip. Supply currents of ~25uA where achieved by tuning the connection parameters. This resulted a CR2032 coin cell battery life exceeding 1 year. Longer for higher capacity batteries. Adding two cheap solar cells easily extended the battery life by 50% or more. A bright room light or a desk lamp is sufficient to power the monitor from the solar cells. A special power circuit was presented to allow the monitor to be run purely from low capacity solar cells.